Hai Vo, a 2009 graduate of Social Ecology at UCI and a CUSA Student Research Associate, has been chosen as a winner of a 2009 Brower Youth Award. 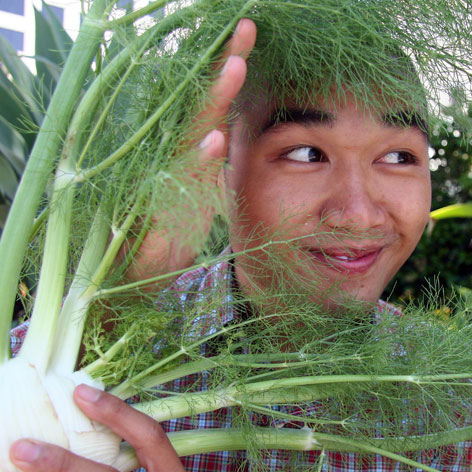 Hai co-founded the Real Food Challenge (RFC) at the University of California at Irvine (UCI) and worked with CUSA on a series of research, education and advocacy projects related to improving the sustainability of campus food systems. In their citation of Hai, Earth Island Institute noted, “In order to educate and connect students, Hai co-organized events that brought students together to “simply eat,” and to discuss their understanding of food. The RFC at UCI has engaged over 500 campus and community members in leadership development, networking convergences, dinners, roundtable events, educational series, and online networks, all centered around sustainable food systems.” Earth Island Institute established the Brower Youth Awards in 2000 to honor founder and legendary environmental activist, David R. Brower and to call forth a new generation of leaders. Vo was formally recognized for his efforts at the 10th Annual Brower Youth Awards on October 20, 2009 in San Francisco, California.